We went back to Wimereux in July on our way home from our last European trip to Croatia and stayed at the Camping Municipal Olympic which is in the town. We spent a couple of days and thoroughly enjoyed it. The campsite details are below. We had a fantastic day out last Saturday. 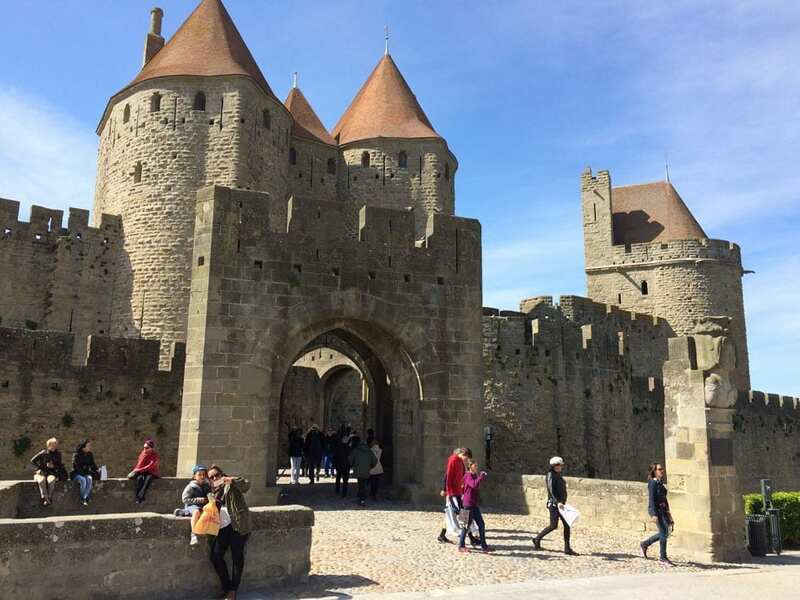 We took our daughter and three grandchildren over to France for the day. It’s the first time the grandchildren have been abroad anywhere and have only just got their first passports so we thought we should use them. We weren’t going to tell them where we were going until we got to the ferry but Faye let the cat out of the bag at the Dartford Crossing by talking about taking an anti-sickness tablet on the boat. Three little pairs of ears pricked up (We thought they were asleep as it was early morning). Boat? they excitedly asked. After that, they were too excited to sleep. It was so funny listening to some of the things they were coming out with and throughout the day they were talking about “a different world”. 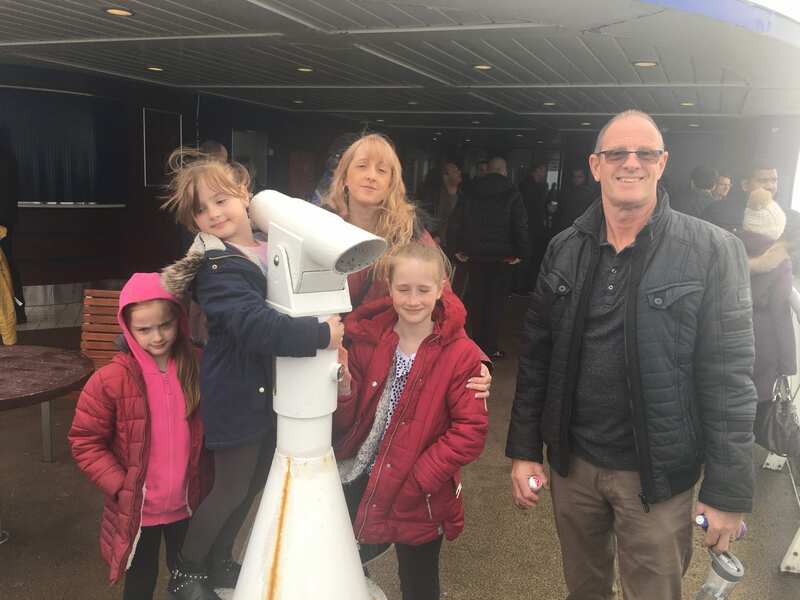 We arrived at Dover early for a 9.30am crossing and thought we might get on the earlier ferry but there were longer queues than usual at security. 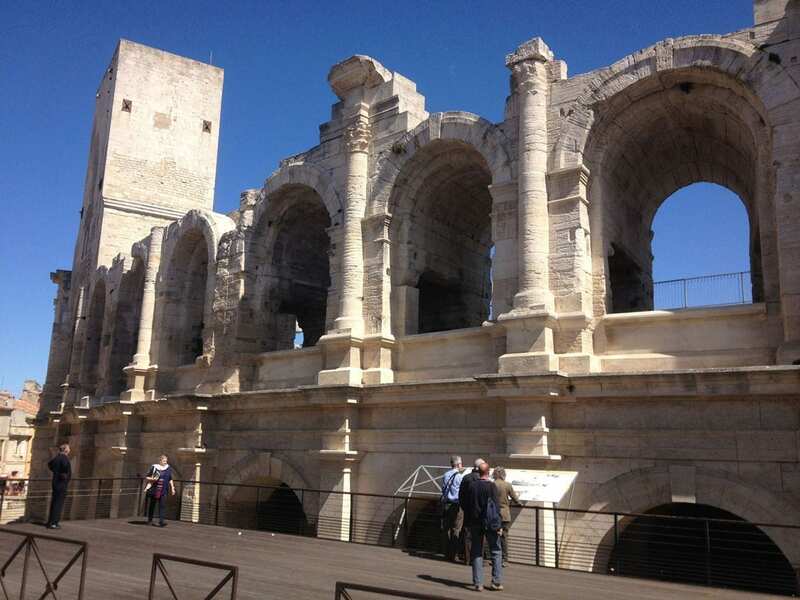 Due to the terrorist incident in the South of France, the day before security was much tighter. The ferry crossing was lovely and smooth and went really quickly. We had coffee then went out on deck for a while before collecting our 6 FREE bottles of wine from the duty-free shop. At this time of year, P&O Ferries have a special offer where the cost of taking the car and up to 9 people on a return crossing is only £29. Plus you get 6 bottles of wine Free which effectively makes your journey free if you’re a wine drinker. This offer may have ended now but I think it is still cheap to take the Dover Calais crossing. Once off the boat, we took the old coast road (D940) towards Boulogne-sur-Mer. We always enjoy this route because it is so scenic with the imposing cliff tops, rolling hills, sand dunes, beautiful beaches and sea views. All along this uncongested road, there are turn-offs and car parks where you can take the walking paths with stunning views along the cliff tops. 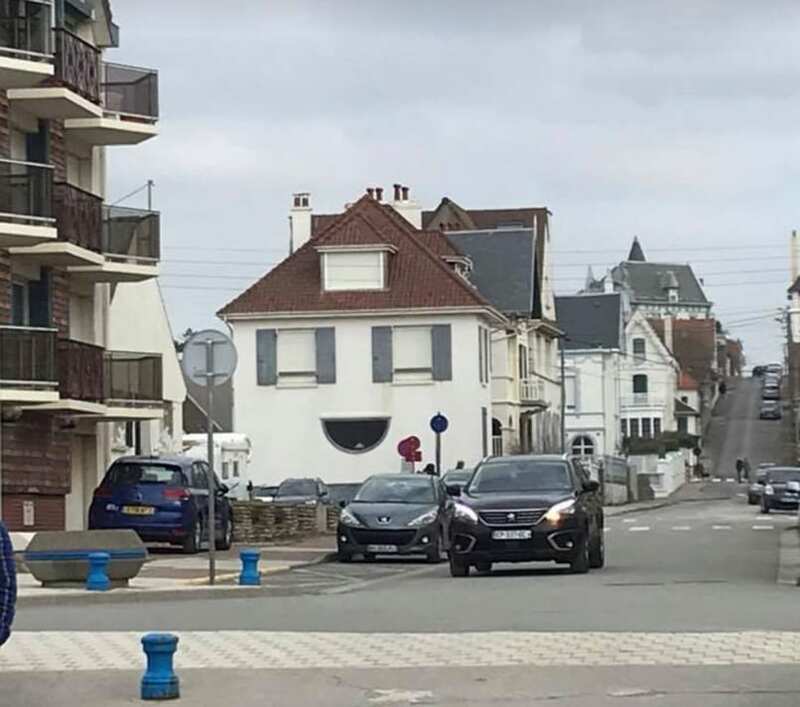 We drove through pretty villages that boast a single shop (a boulangerie of course) and seaside resorts that are real gems. There are museums, monuments, military cemeteries and WW2 bunkers along the road so Ray was giving the kids a little history lesson as we were going along. As much as we were enjoying the drive we did have a destination in mind. 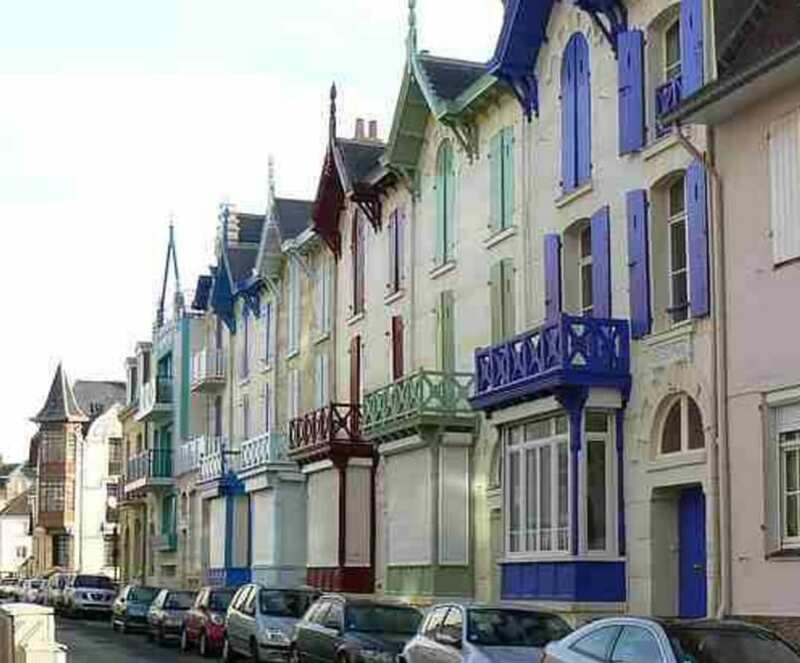 Wimereux, a delightful little seaside town which lies between the ports of Calais and Boulogne-sur-Mer on the Cote d’Opale. 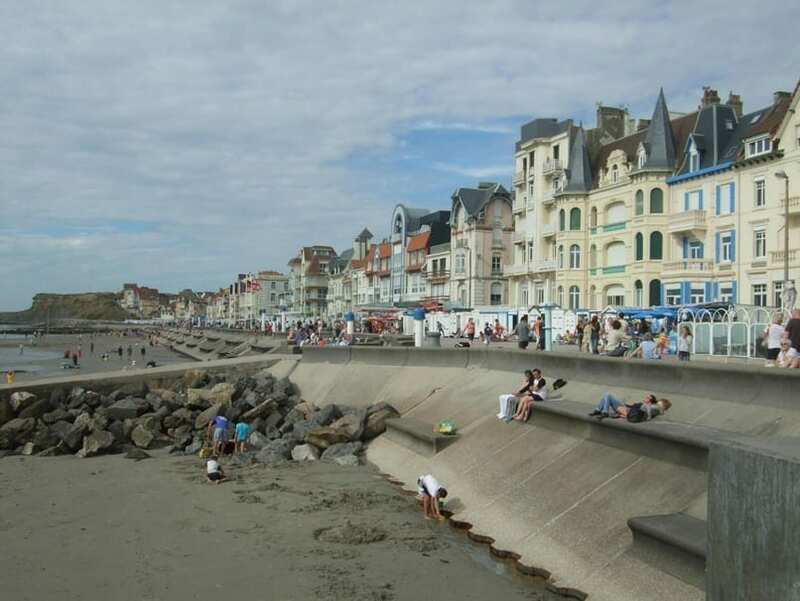 Wimereux is the oldest seaside resort on the Opale coast. What we like about this town is the lovely long promenade you can walk along which is dotted with restaurants, bars and hotels. It has a wide sand and pebble beach which the children couldn’t wait to get on. 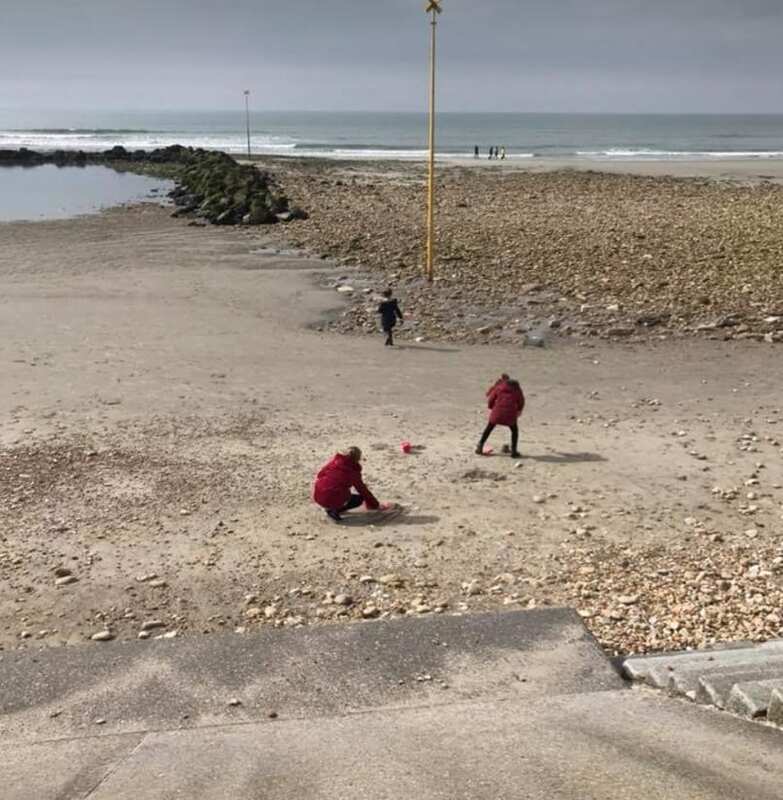 After a lunch of Moules and Frites, we let them go on the beach with their buckets and spades to make some sandcastles. The beach is a paradise for wind and kite surfers and in fact for all kinds of water sports. 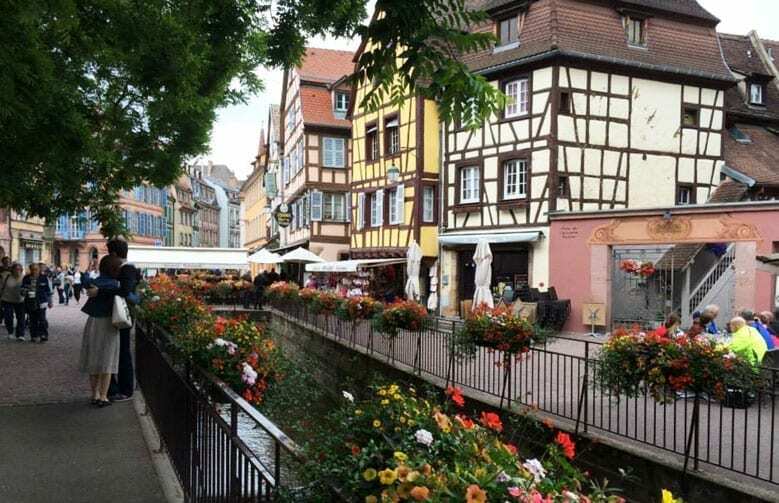 If you turn off the promenade you can walk through narrow streets to the main street which contains even more restaurants and a selection of shops. If you visited on a Tuesday or Friday morning you would find a local market there. 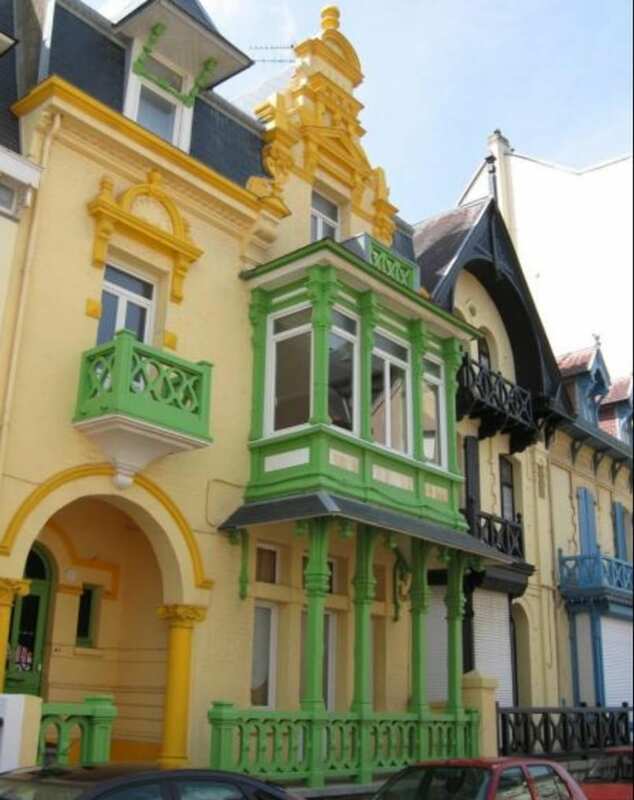 Another favourite thing about this town is looking at the many colourful and beautiful villas (Belle Epoque Villas). They are splendid villas with very stylish architecture dating back to the nineteenth century. 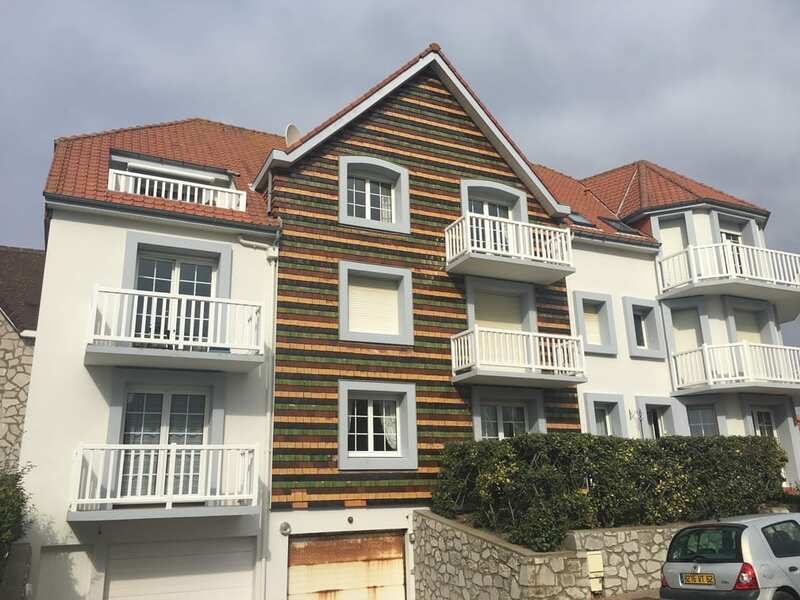 They are all very different with their terraces, balconies, bow windows, friezes and one with tile mosaics representing a boat sailing on the sea and seagulls. Many have names like ‘Breeze’ or ‘The frigate’. Considering it was out of season and still a bit chilly it was quite busy with many people out taking a winter stroll along the promenade or sitting outside the restaurants. At this time of year it’s just some table and chairs but in the summer they have the awnings and sun umbrellas out and from the picture below I have borrowed from the internet they have pretty blue beach huts lining the promenade. We managed to find a parking space in one of the side roads and apparently there is a car park in the centre but even if you drove out of town a little you should find a parking spot. There is a walk on the Dunes de la Slack which runs along the dunes and has lovely sea views. For those of you into golf, there is an 18 hole golf course on the edge of town which has outstanding views across the channel. On a clear day, you can see the White Cliffs of Dover. 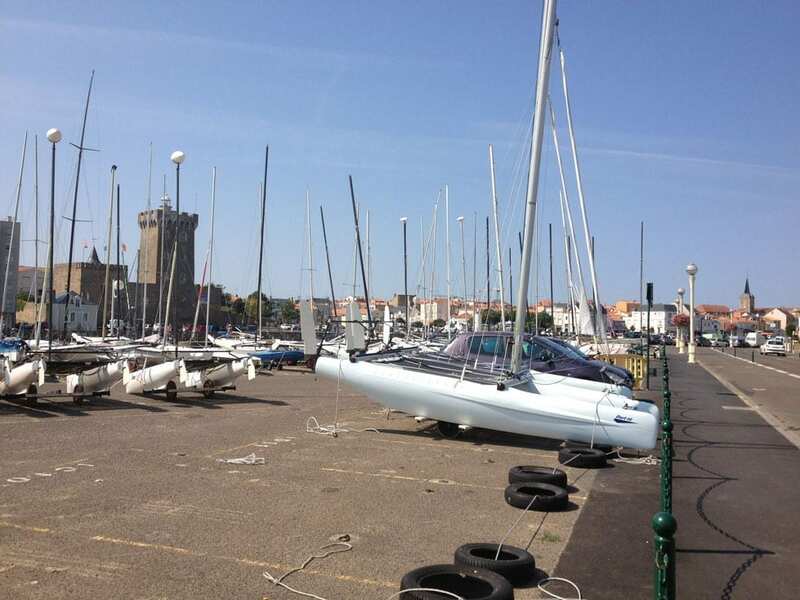 The Cote d’Opale would make a great destination for a weekend break too. There are plenty of hotels and little campsites around and plenty of lovely little villages to explore. 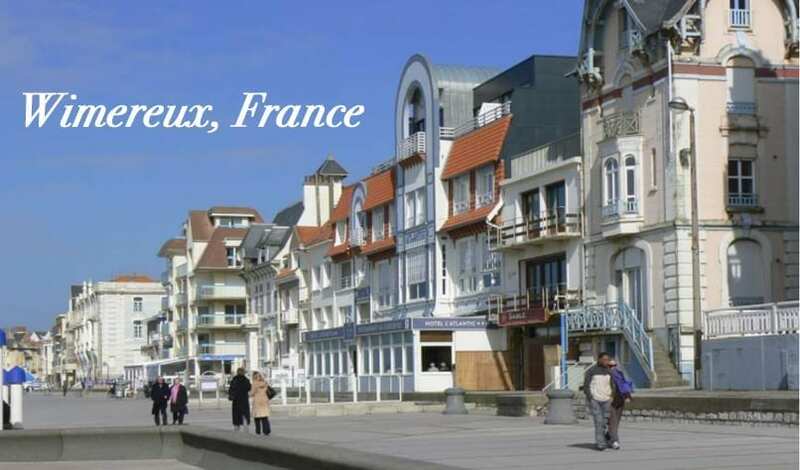 Just 4 km further on is Boulogne-sur-Mer which has a sea life centre and plenty of shops, restaurants and bars, in fact, it’s a large town. 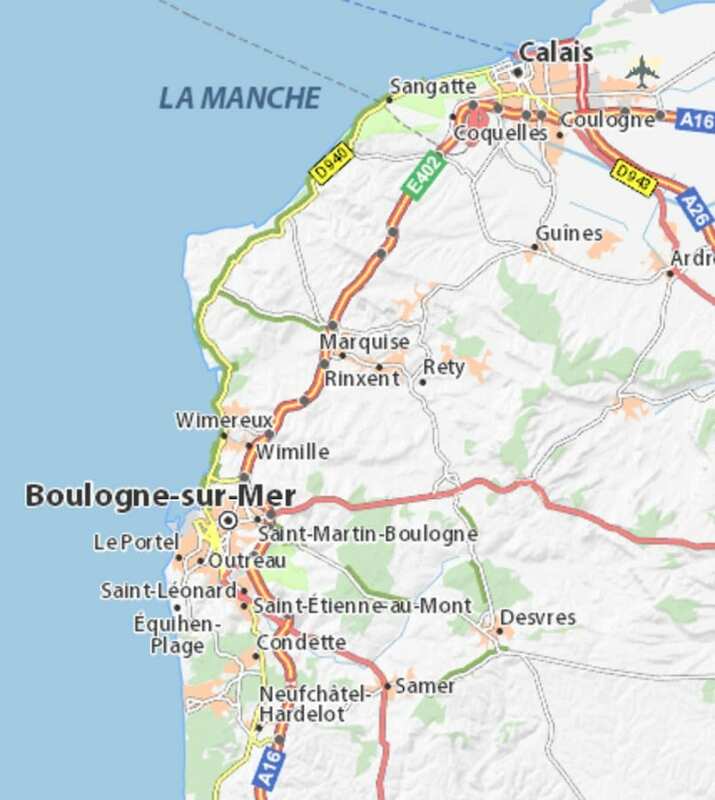 We drove through it to take a look but by then was feeling tired after walking around Wimereux and time was getting on so we took the A16 motorway back to Calais which was quicker although not as beautiful as the coast road. This is an ACSI discount site so was only 17 euros using the card. 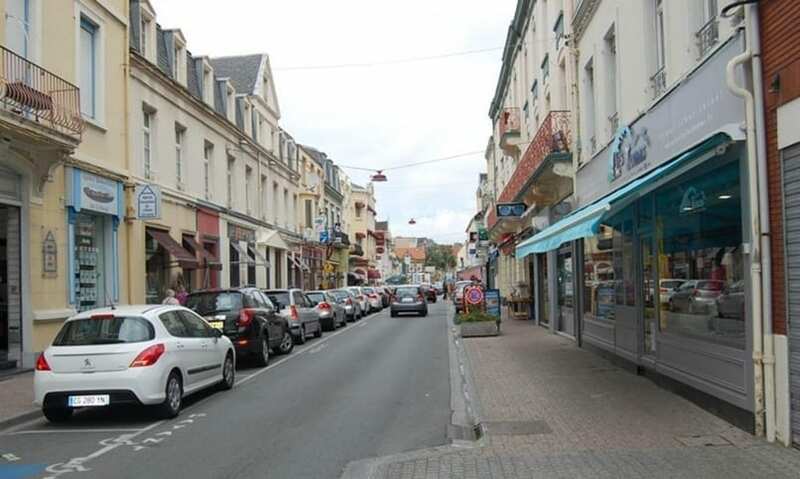 Camping Municipal Olympic is located in Wimereux in Pas-de-Calais, in Hauts-de-France. 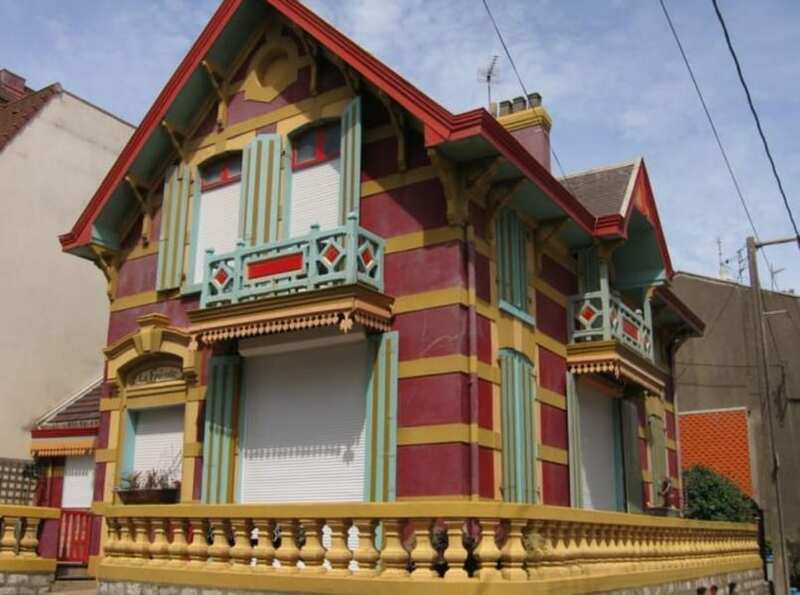 It is only 400 m from the sea and attractive town. Good size pitch marked out by hedges, clean toilets lovely views of the countryside. 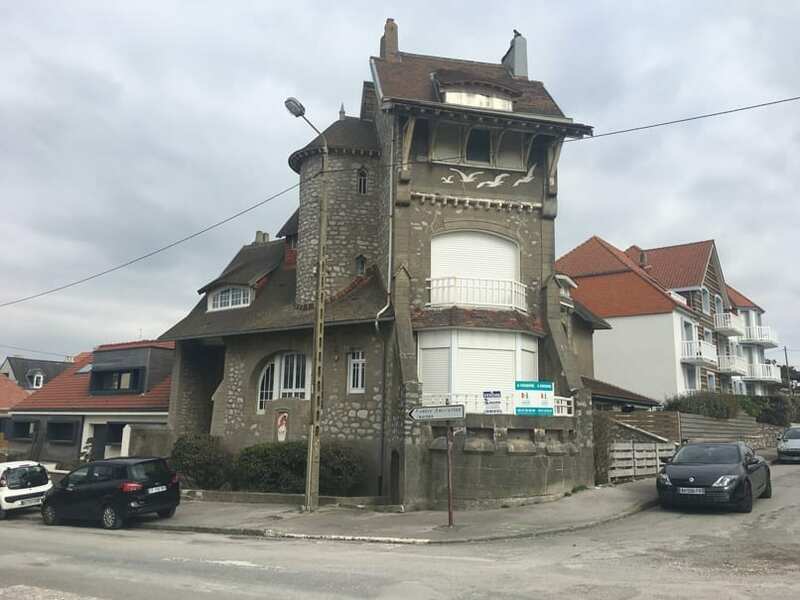 You can catch the bus into Boulogne-sur-Mer from outside the entrance. There is an English speaking vet in the town which is useful for a pet passport.